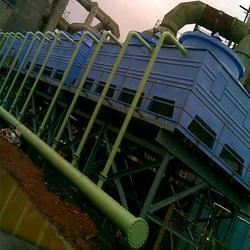 The compact FRP cooling towers manufactured by us are made space saving. Fibre Reinforced Plastic (FRP) cooling towers constitute multiple fibers in mat form. These fibres are joined together with the help of catalyst, accelerator and polyester resin. The range is specially known for its high strength, good chemical resistance, durability and acceptable cost. Our wide assortment of towers are known for their efficiency and outstanding performance. These are made using best raw material and available in capacity range 10 TR to 2000 TR in Single Cell and Multi-Cell FRP Cooling Towers Configurations. These are generally light in weight and consume less power. Our flawless range also allow roof installation in an easier way. We offer these towers at market leading rates. Capacity Range: 10TR to 2000TR in Single Cell and Multi-Cell Configurations. High Capacities, i.e. 500 CMH to 3000 CMH easily possible. For Hot Inlet Temp as high as 70 deg. C, and Cold Temp as low as 30 deg. C (at WBT 27 deg. C). Special Splash type Fills for sedimented Water Quality.